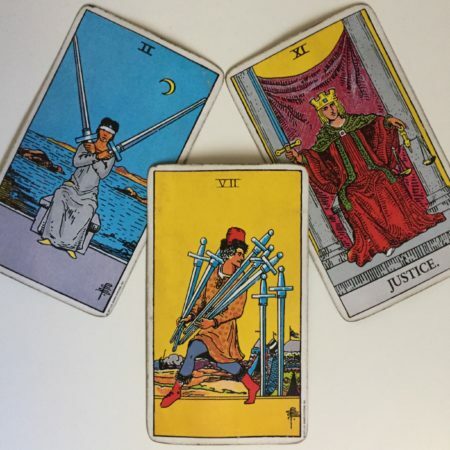 In light of the current and upcoming planetary transits, I felt inspired to write about the seven of swords tarot card. I draw this card often when there is something that should be taken care of properly, but hasn’t. This is either because it needs to be addressed at a later time, or possibly because it should be avoided altogether. The figure in the card has five swords in his arms but has dropped two. I normally interpret this as “dropping the ball”, or consciously “trying to get away” with something he shouldn’t. There is innumerable ways to interpret this card, although, “thievery, deception, sneakiness, sloppiness, ill-intent, and unwanted escape are the main themes. Let’s explore some alternative views on how this card’s meaning can be applied. Excluding the outer planets (Uranus, Neptune & Pluto), three of the five planets that can go retrograde are now in their apparent backward motion: Mars, Jupiter and Saturn. Of course, the Sun & Moon never go retrograde, and Rahu/Ketu are always retrograde. Soon to be joining the retrograde party is Mercury on Thursday, July 26th. Although by then, Jupiter will have gone direct (on July 10th). This seven of swords card has such retrogradey energy. The two dropped swords, which can be seen as a skipped step or a mistake, will need to be reconciled and corrected at some point. Retrogrades in general have a “do-over” energy, in order to right the wrongs or adjust the plan. Planets in retrograde have a more intense quality of to what that planet represents, that urges people to be more introspective and reflect on their plans and decisions. Maybe this is where we could see a possibility of the thief’s conscience come into play in this card. In order to make corrections to a new plan of action or a new strategy to be implemented, awareness must first come into play. It’s much easier, rather, lazier to want to hastily move forward, but that skipped step will sooner or later come back to haunt him because of a little thing called karma. Justice has a natural reckoning equally proportionate to the crime or trespass committed. What goes up, must come down. For every action, there is an equal and opposite reaction. This card appearing is a warning. Actually, it is a sign of grace that there is still time to make corrections to be thorough, accountable and responsible for our actions. Free will is a blessing. We get to make decisions. The two swords behind him signifies a choice. The two of swords card literally means “choices”. Do I decide to do this, or that? This card indicates that there is still time to adjust our actions and reconsider our choices, just as the planets are allowing now. With these retrogrades, we may even feel a more acute pressure to correct our course. Right now, we can either ignore what obviously needs to be done by a slew of excuses, just to have to account for them later, or we can use the energy given to us to make the extra effort to backtrack a little, reassess, reevaluate and choose a different fate.